Volvo V90 Cross Country Performance, Engine, Ride, Handling | What Car? 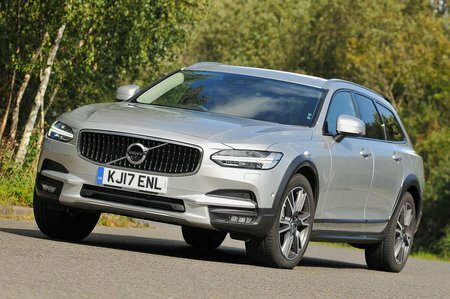 The theory is that, like the E-Class All-Terrain and A6 Allroad, the V90 Cross Country is designed to be more comfortable and easy-going than its road-biased V90 sibling. The reality is somewhat different. As standard, you get passive dampers all round, with steel springs at the front and air springs at the rear. But even with the supposedly more pliant optional all-round adaptive dampers fitted, and softened to Comfort mode, at all speeds the Cross Country sends noticeably harsher impacts through to your behind than the regular V90. On the motorway, it also picks up on small ripples, so you feel a shimmy through the body that, while not impacting, is annoying on a long trip. That said, it is reasonably composed over long-wave crests and dips. There is a touch more body lean during hard cornering than you’d get in the regular V90 – the result of having a higher centre of gravity than the lower standard car – but that’s true of its off-road-biased Mercedes and Audi rivals, too. With the optional adaptive dampers fitted, you can stiffen up the suspension with a Sport mode, which makes the Cross Country turn in to corners more keenly, but it exacerbates the ride issues. A further Off Road mode lets you make use of that 65mm of extra ground clearance by activating features including hill descent control and by tuning the four-wheel drive system to cope better across muddy fields (you still can’t tackle terrain that’s much more brutal). The system is clever enough that it’ll revert to Comfort mode if you forget to disengage it when you’re back on the road and travelling at higher speeds. Regardless of mode, the steering is precise but has little feedback through the rim to help you gauge grip levels, and it has a strong self-centring action either side of straight ahead. This is great for sticking to a steady line on motorways but irritating through flowing twists and turns. Four engines are offered, starting with the most popular and our recommended D4. This 2.0-litre diesel is a little sluggish off the line but, once in its mid-range, provides useful urge for easy progress on urban streets, country roads and motorways. It’s a bit clattery at idle, mind, and the standard eight-speed automatic gearbox has an annoying habit of dithering as you’re pulling out of junctions. You don’t get any steering wheel-mounted paddles for manual shifting, either, although you can hold it in a gear using the gear selector. If you need something more responsive and powerful, there’s the appealingly named D5 Power Pulse 2.0 diesel. This uses compressed air to help the turbocharger kick in more promptly and the result is usefully more urgent acceleration from low revs, all the way through to its limiter. Quicker still is the T5 petrol, a refined and punchy engine that's also usefully cheaper than the D5. Just remember that fuel economy won't be anywhere near as good as either of the diesels. Finally, there’s the petrol T6. Again, it’s a 2.0-litre unit, but this one uses a supercharger to give excellent low-down pick and a turbocharger to bolster performance at medium to high revs. It’s smoother than the diesels and faster-accelerating – 0-62mph takes 6.3sec – but you’ll be looking at average economy in the low to mid 30s. 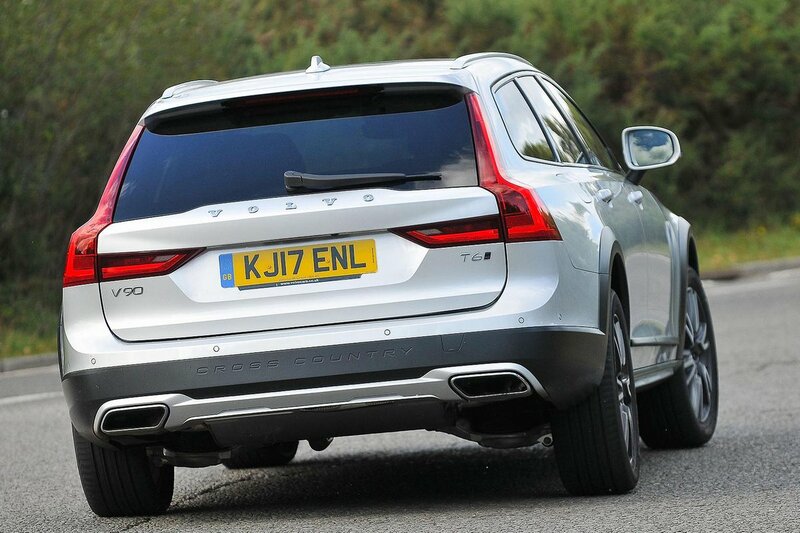 For a premium estate, the V90 Cross Country isn’t the quietest cruiser. There's a fair amount of wind noise on the motorway, and the softer tyres (compared with the regular V90) that are standard generate some extra road noise.